Chart-well Green Fascia trims and soffits. Full replacement fascias and fascia cover boards available, In a range of sizes. Product Length: 5m Product Width: 12mm Product Thickness: 6mm Accreditations: BSI Approved Guarantees: 15 years Product Type: uPVC Chartwell Green Quadrant Trim .. Product Length: 5m Product Width: 150mm Accreditations: BSI Approved Guarantees: 10 years Product Type: 9mm Chartwell Green Soffit Board Other: Available in a range of colours including, Rosewood, White, Mahogany, Black, Grey, Irish Oak, Green and Cream, all of which are protecte.. Product Length: 5m Product Width: 175mm Product Thickness: 16mm Return Leg: 32mm Accreditations: BSI Approved Guarantees: 10 years Product Type: uPVC 16mm Chartwell Green Square Fascia Other: Available in a range of colours including, Light Oak, White, Black Ash, Rosewood, .. Product Length: 5m Product Width: 225mm Product Thickness: 16mm Return Leg: 32mm Accreditations: BSI Approved Guarantees: 10 years Product Type: uPVC 16mm Chartwell Green Square Fascia Other: Available in a range of colours including, Light Oak, White, Black Ash, Rosewood, .. Product Length: 5m Product Width: 405mm Product Thickness: 16mm Return Leg: 32mm Accreditations: BSI Approved Guarantees: 10 years Product Type: uPVC 16mm Chartwell Green Square Fascia Other: Available in a range of colours including, Light Oak, White, Black Ash, Rosewood, .. Product Length: 5m Product Width: 200mm Product Thickness: 9mm Accreditations: BSI Approved Guarantees: 10 years Product Type: 9mm Chartwell Green Soffit Board Other: Available in a range of colours including, Rosewood, White, Mahogany, Black, Grey, Irish Oak, Green and Cream,.. Product Length: 5m Product Width: 300mm Product Thickness: 9mm Accreditations: BSI Approved Guarantees: 10 years Product Type: 9mm Chartwell Green Soffit Board Other: Available in a range of colours including, Rosewood, White, Mahogany, Black, Grey, Irish Oak, Green and Cream,.. Product Length: 5m Product Width: 400mm Product Thickness: 9mm Accreditations: BSI Approved Guarantees: 10 years Product Type: 9mm Chartwell Green Soffit Board Other: Available in a range of colours including, Rosewood, White, Mahogany, Black, Grey, Irish Oak, Green and Cream,.. Product Length: 500mm Product Width: 50mm Accreditations: BSI Approved Guarantees: 10 years Product Type: uPVC Chartwell Green 500mm Square Double Ended Fascia Joint .. 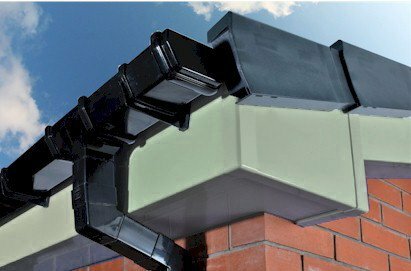 Product Length: 500mm Product Width: 50mm x 50mm Accreditations: BSI Approved Guarantees: 10 years Product Type: uPVC Chartwell Green External Square Fascia Double Ended Corner .. Manufacturer: Homeline Product Length: 5m Accreditations: BSI Approved Product Type: Chartwell Green uPVC Hollow Soffit J-Trim .. Brilliant Chartwell Green uPVC 20mm Cloaking Fillet 5m Often used for covering small gaps between boards, the 20mm Brilliant Chartwell Green Edge Fillet is a popular product for neatening the edges of Brillianr Chartwell Green uPVC doors and windows. Colour matches most Brilliant Chartwell G.. Manufacturer: Homeline Product Length: 5m Product Dimension: 25mm Accreditations: BSI Approved Guarantees: 10 years Product Type: uPVC Chartwell Green D-Section .. Manufacturer: Homeline Product Length: 5m Accreditations: BSI Approved Product Type: Chartwell Green uPVC Hollow Soffit H-Trim ..
RAL Colour: N/A Product Length: 5m Product Width: 19mm Product Thickness: 6mm Accreditations: BSI Approved Guarantees: 10 years Product Type: uPVC Chartwell Green Quadrant Trim ..